Royal Caribbean has been teasing us for months with the entertainment on offer for the cruise lines up coming cruise ship Quantum of the Seas so it comes to no surprise the new entertainment on offer for when the ship launches this November. The most important aspect of the entertainment that Royal Caribbean is bringing to its guests is “new” and “cruise industry” firsts. The cruise line has so many different shows and performances to offer and some really will be breaking the barrier in innovation which even Broadway or London’s West End would be jealous of. Two70 which is a dedicated space onboard Quantum of the Seas where there will be futuristic and innovative performances will be in the driving seat for Royal Caribbeans entertainment. One of the main highlights of Two70 is Vistarama which are a floor to ceiling windows that also project amazing images in 12K resolution. Also featured at Two70 are the only performance of its kind at sea and on land, it;s the Roboscreens which move on large robotic arms displaying a perfect 3D and visual experience. 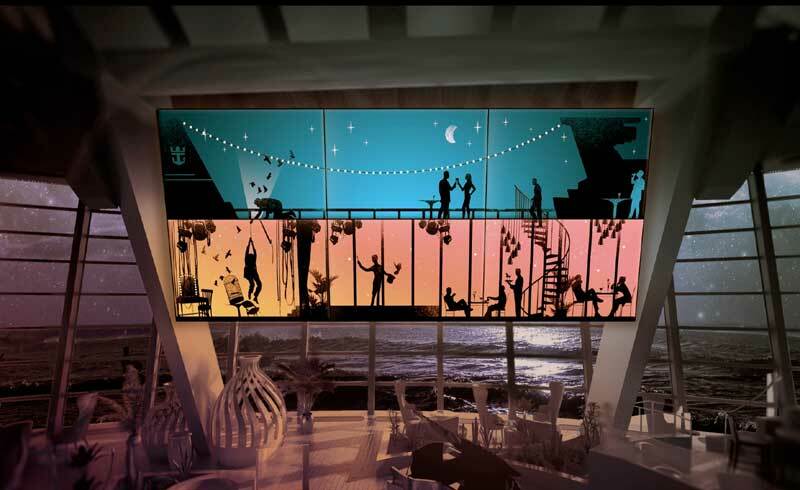 Quantum of the Seas sister ship Anthem of the Seas will also be featuring similar entertainment and that ship will launch in 2015. Has Royal Caribbean gone all out this time? Let us know what you think in the comments below.